The standard correction is with a DIP joint fusion or excision arthroplasty. The largest series (Coughlin 1995) found that release of the long flexor tendon improved the results slightly. The procedure can readily be done under local anaesthetic, and the patient can weightbear in a sandal immediately afterward. A transverse incision over the head of the distal phalanx is deepened directly into the DIP joint. The joint surfaces are excised. The long flexor tendon can be released from its insertion into the distal phalanx through the same incision. The toe is stabilised with a wire. We advance this into the proximal phalanx as purchase in the middle phalanx is usually poor. The wire is removed at 4 weeks. In children there is a tight long flexor tendon but usually no fixed deformity, and the deformity can be corrected with a minimal-incision flexor tenotomy. 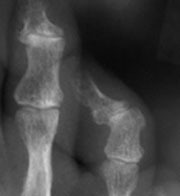 In adults there is usually a varus deformity of the middle phalanx. An osteotomy of this phalanx has been described but results in small bone fragments which are difficult to stabilise. A DIPJ fusion with realignment of the toe is simpler. Again, it can readily be done under local anaesthetic, and the patient can weightbear in a sandal immediately afterward. Corrective DIP joint fusion stabilised with a wire - easier!